Another digest of my daily posts during Hull2017 on Facebook, about the pictures added daily on the intro page at Hull Photos. Comments and corrections to the captions and texts about the pictures are always welcome here or on Facebook. In the distance are the raised Drypool Bridge, apparently under repair and on the left the Clarence Flour Mills. On the left the moored dredger, Burcom Sand, with a barge moored alongside. Under the bridge can be seen the Trinity House Buoy Shed and immediately to its right an old warehouse. 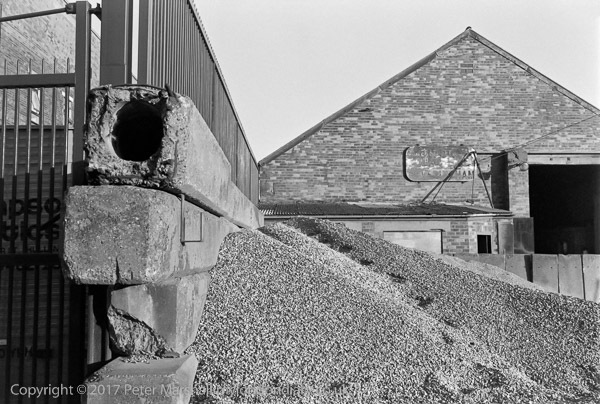 Below this is the entrance to a dry dock and then to the right one of two sheds belonging to the Yorkshire Dry Dock Co Ltd, Shipbuilders ship repairers – as it helpfully states on the second shed at far right. Between the shed is the entrance to Queen’s Dock Basin, converted to use by the company as a dry dock at some time after Queen’s Dock was filled in during the 1930s. A large crane towers over the shipyard, and another just intrudes at the top left. Clearly there was building work going on on both sides of the River Hull, though not actually on its banks. Studio Ann Carlton was started in 1969 when Anne Finestein made a unique chess set for her husband and other chess players wanted copies. Soon the business outgrew her garden shed and she moved into a former fish smoking house on Flinton St. 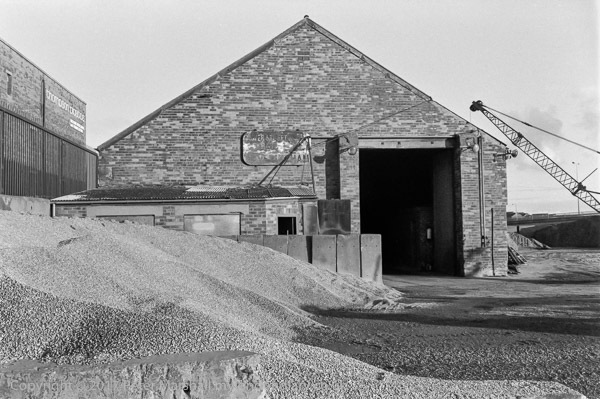 The company was acquired by Clayhithe Plc in the early 1980s who built a modern factory on the site. This closed after the company was bought by Traditional Games who closed the factory and moved production to China. In 2014 the rights to SAC were bought by Ancestors’ of Dover Ltd and the expensive (and to my mind rather ugly) chess and backgammon sets are now produced in Folkestone. The building is still there, though now the roof is blue rather than the red-brown when I took this picture (not that this shows in the black and white image.) The nearer buildings on the left have been replaced, but further down the road the premised of Batty Joiners are still in use. Batty Joinery was established in 1919 as a bespoke joinery manufacturers and is still crafting high-end traditional joinery products, employing around 30 skilled workers. It became part of the Hall Group in the 1960s, but fortunately returned to independence and so was not affected when the Hall Group went into administration in January 2017. Maconochie Seafoods were incorporated as a private Limited Company in 1969 and apparently ceased trading around 1991. F Smales & Son (Fish Merchants) Limited, ‘Famous for Fish Since 1937’ are now based in a more modern and rather larger building on West Dock Street, as well as a giant shed on Gillett St and Witty St. Their activities are stated at Companies House as: Processing and preserving of fish, crustaceans and molluscs and Wholesale of other food, including fish, crustaceans and molluscs. Started by Tim Smales on the Hull Fish dock it is still a family firm, operating in three main industry sectors, fish and chips, food service, all based around fish and seafood. The distant view down the road appears to be of the docks, but I am unsure of the precise location. 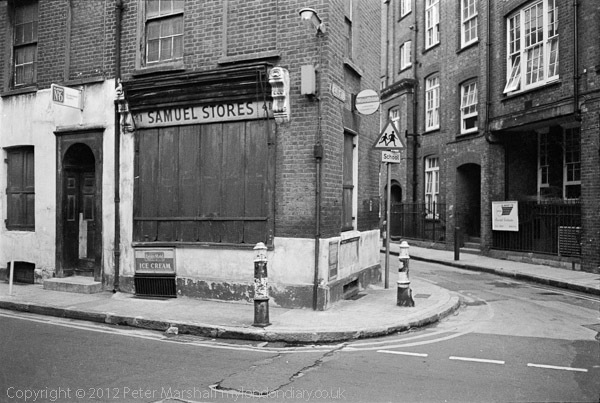 It was the next picture on the film after that taken on the corner of Flinton St and West Dock Avenue. 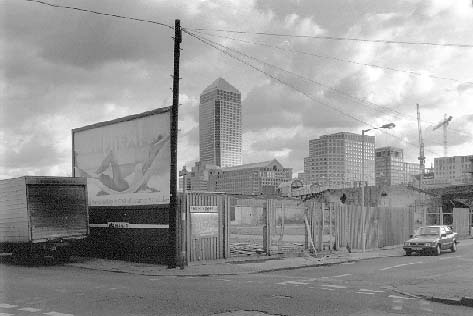 I think all of the buildings in the picture have probably been demolished, with much of the area covered by more modern shed-like buildings. 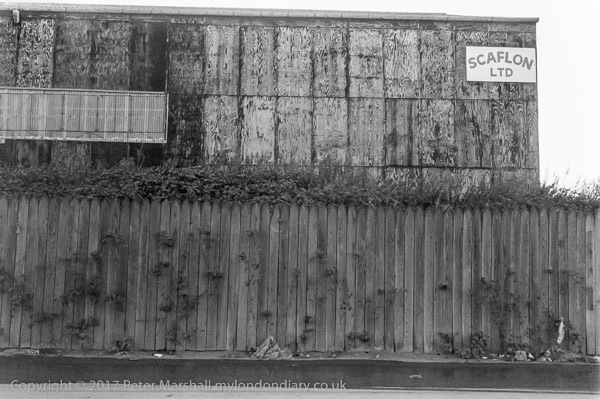 Scaflon Marine Ltd were on Earles Rd, at the north east edge of Victoria Dock, off the Hedon Rd. The company which repaired ships and containers was incorporated as a private limited company in 1981 and went into liquidation in 1998. It looked as if what had perhaps previously been an open timber shed had been rather crudely enclosed using sheets of plywood, the wood grain of its outer veneer clearly showing. Perhaps because this building was on the side one of Hull’s few hills, coming up from Victoria Dock, my attempts at levelling and squaring up the image were even less successful than usual. 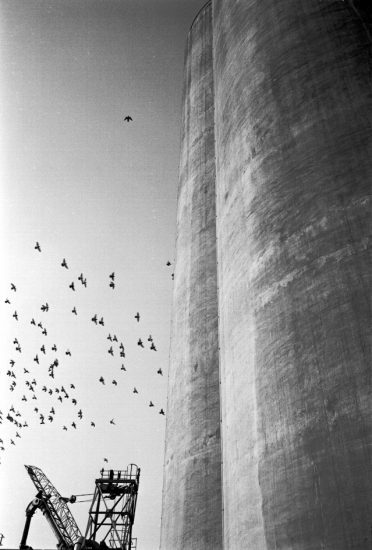 That could have been corrected either in the darkroom or now on computer, but I have left it exactly as taken. Another picture of Scaflon Ltd, and one of the few hills in Hull, coming up from the dock. Earle’s Road led to the shipbuilding company started on the bank of the Humber by brothers Charles and William Earle in 1845 and saved from extinction when bought by Charles Wilson of the Wilson Line in 1900. In 1932 it was taken over by the National Shipbuilders Securities (NSS), a government sponsored scheme to rationalise the shipbuilding industry by selling most of it off. 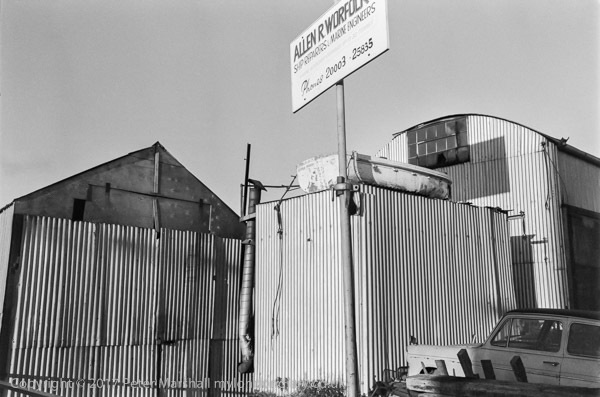 They sold off Earle’s machinery and tools, mainly to Kowloon in Hong Kong, and set a restrictive covenant on the site which forbade any shipbuilding there for the next 60 years. A picture taken on my way back from Victoria Dock to the City Centre. There appear to be two lanes on the road, so this was Hedon Rd, largely replaced by a new A63 after the opening of the Myton Bridge a few years earlier. Although the building in the middle of this image is boarded up, there is a lit fluorescent tube visible in the window at the extreme left, showing it still to be in use. 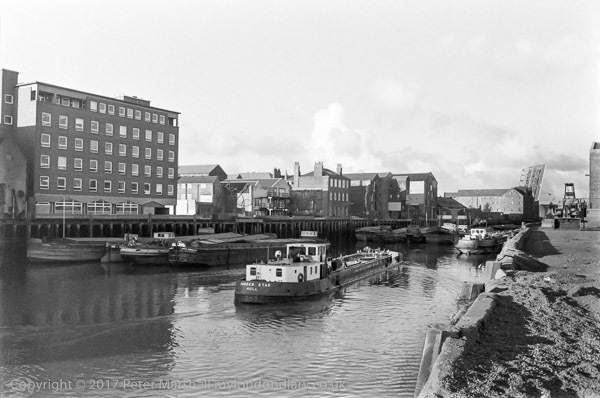 Many of the buildings along Hedon Road were saw mills, as Victoria Dock was a major timber dock for the UK, bringing in timber from Scandinavia and the Baltic. The right half of this image shows the Victoria And Continental Coffee Club, on the south-east corner of Great Union St and Clarence St. Gamebore Cartridges are still in business and using the same buidling, formerly a part of Rank’s flour mill immediately to the north of Drypool Bridge. The Coffee club site is now part of the Travis Perkins yard, piled with building materials. I’m told it was a notorious Hull nightspot, open after the pubs had shut at 11pm, and although officially the only drink was coffee, others were available under the counter, including some toxic home-brew whisky. 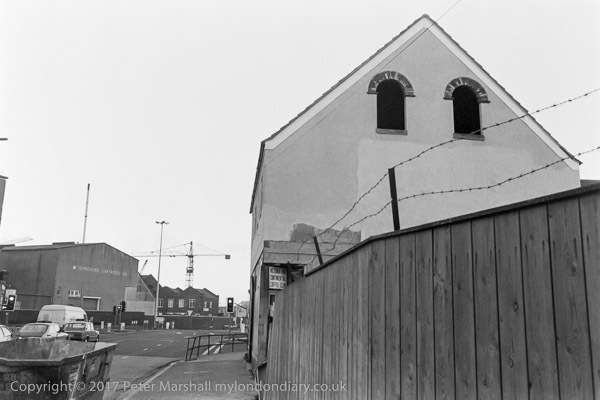 It was a part of Hull’s red light district its southern dockside edge, and allegedly this and the ‘Monkey House’, the Victoria pub a short distance along the Hedon Road, were popular places to find prostitutes. 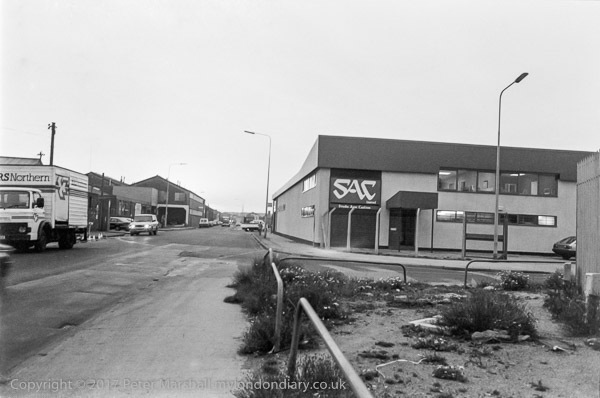 The Club was still open when I took this picture, but closed down some time around 2000, and a few years later burnt down in a mysterious fire, a fate rather common in Hull. 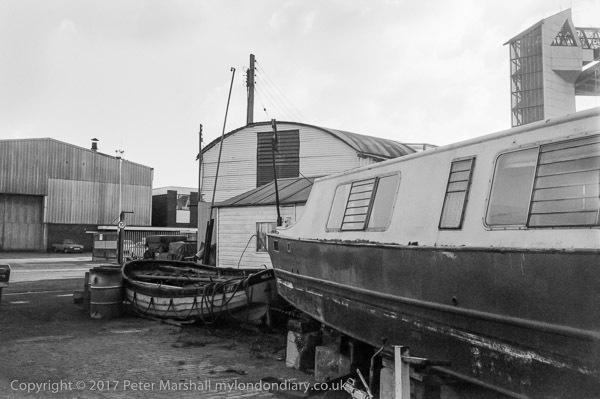 Earlier today I published the final image in my daily posts for Hull2017 to Hull Photos, with my short comments on Facebook. Although the year-long project has ended I will still be putting more pictures on the site, but just not one every day – probably in occasional batches. I’ll try to remember to post about these here and on Facebook. It’s worth taking the time to look through the post of TIME’s top 100 photos of 2017, though like all such lists there are some pictures you probably wouldn’t yourself chose. Are these the best 100 pictures made this year? Certainly not, though some might qualify for most people’s selection, though others seem a little mundane. Are they photos of the 100 top news events of the year? Again while some are, we might disagree about others, and, being TIME, it obviously at times shows a rather US-centric position. But there remains much fine photography that does show and perhaps stimulate thought and action about important events of our time. 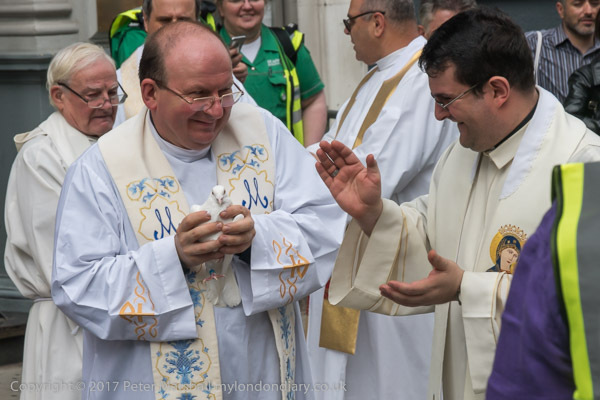 Another digest of daily posts during Hull2017 on Facebook, about the pictures added daily on the intro page at Hull Photos. Comments and corrections to the captions and texts about the pictures are always welcome here or on Facebook. On top of the container is the same boat as in a previous image, but seen from the opposite side. Above the container are warehouses (converted into flats) on the opposite bank of the River Hull, a crane on the Northern Divers site and the raised Drypool Bridge. 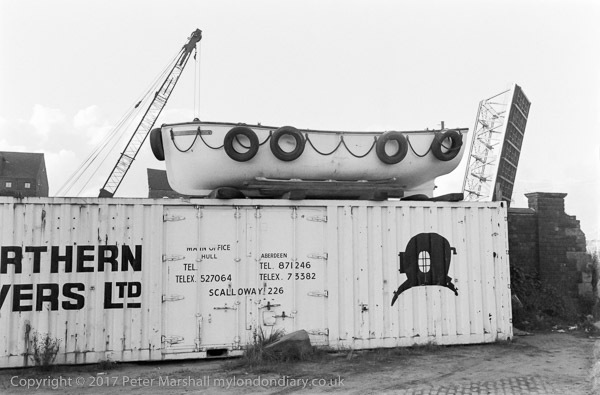 I was particularly attracted by the drawing of the diving helmet on the side of the container. Drypool bridge was raised through the whole series of pictures I made on this day, and I think must have been undergoing repair. This view is from a short distance above the bridge looking towards the mouth of the river. Above the tank and pipe at the left are the buildings of Rank’s flour mills. Only the buildings at left remain, now used by Shotwell for cartridge making. The further building, the prominent local landmark of the Clarence Mill, was sadly demolished recently, a terrible loss to the city’s heritage. The vessel at right is the Burcom Sand, a grab hopper dredger. A further vessel is visible beyond it, but I can’t quite make out its name, but I think was probably another dredger. This picture was taken from an identical viewpoint as the previous image and I clearly intended the two to be viewed together, possibly joined as a single panoramic image (though this was very tricky before it became possible to use computer software on digital files) but more likely as a diptych. 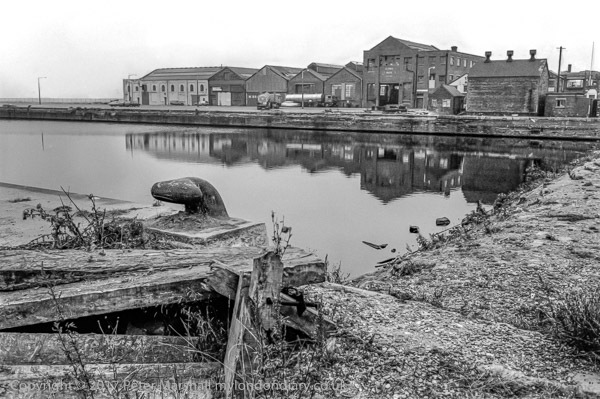 The shed in the centre of the image is on the opposite bank of the River Hull and was a part of the Yorkshire Dry Dock’s premises. Above a roof near the right edge you can see the cupola on the Old Dock Offices on Dock Office Row and next to it the top of the Guildhall. The two images do merge perfectly in software to form a wider view, but cropping to give a rectangular format results in the loss of some of the peripheral subject matter and I prefer to show them as separate images. This view is looking upstream from the east bank of the River Hull. The industrial premises at left have been replaced by a new block of apartments and the warehouse on the opposite side of the road is now waste ground used for parking and Napoleons Casino. The flats further back are still there, at the north end of Trippet St. I think I took this picture as a mystery, and its one I was unable to solve. 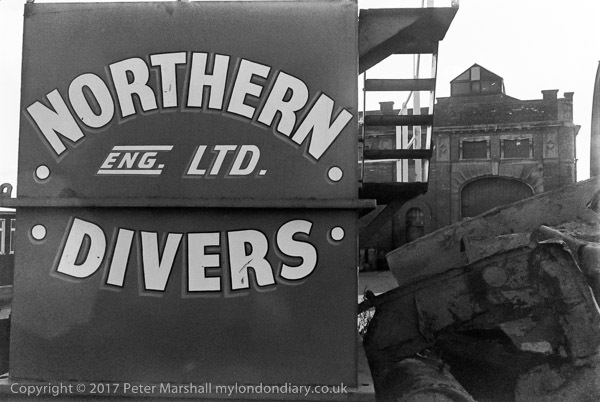 The lettering on the sign was almost lost and the only parts which are clear are those that are obvious, the ‘&Co…Ltd’ and on the lower line ‘WAREHOUSE’. Between the Co and the Ltd is a year, probably 1928, which could well be when this shed was erected. I puzzled at some length over the name, which is hardly clearer on the full size image than on the small web version. It certainly seems to have a B and a T, perhaps and initial and ‘ABBOTT. Thanks to Mike Patterson for giving me the answer on Facebook that this was Garbutt and Co on Great Union St. I still wonder what the word before WAREHOUSE was. The BU is pretty clear but I can’t make out the rest. The Garbutts are an old Hull family, but I can’t find anything about this business on-line. A William Garbutt was one of Hull’s early Quakers around 1660, and later at the start of the 19th century Robert Garbutt was a Methodist, and the Garbutts were apparently a leading Primitive Methodist family in the area. William Parkinson Garbutt lived on Anlaby Rd, as did David Parkinson Garbutt his son, who was the developer of the Avenues area off Princes Rd; his brother William had a ship building business. 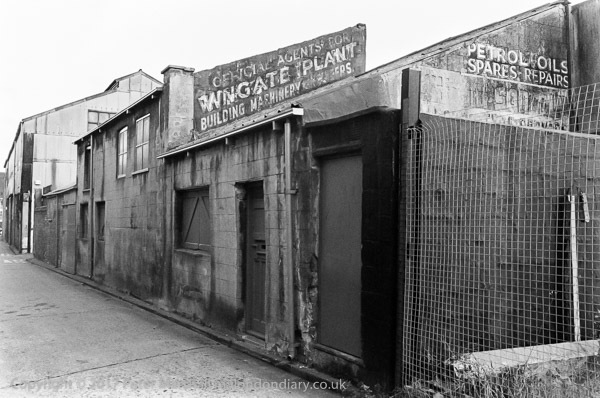 The sign on the top of the building I think reads ‘Official Agents For Wingate Plant Building Machinery‘, and although much changed, to my surprise all the buildings in this picture were still standing earlier this year when I walked briefly down Coelus St, off Great Union St. 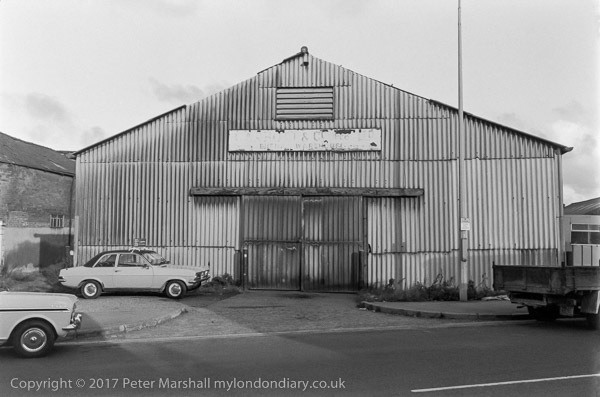 The foreground building has lost all its doors and windows and was just white plaster with no visible signage, but the large shed was BSR Body Style Refinishers ‘For All Your Body Work Needs‘. Later this year there was a report in the Hull Daily Mail of a fire in their premises. 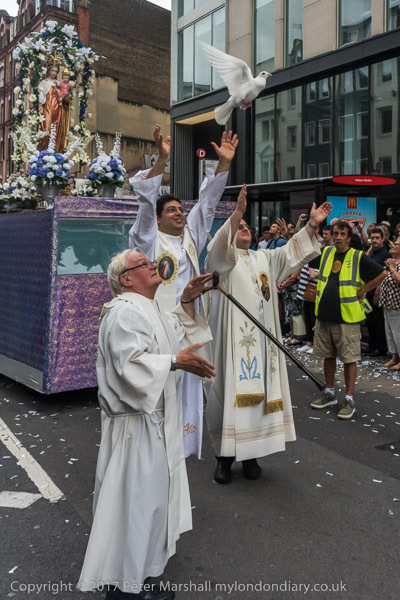 Coelus (or Caelus) was the main Roman god of the sky and also used to mean the sky or heaven – as in ‘Regina Coeli’: though few would now confuse this street with heaven it seems to most likely derivation for the name. It is also the name of a whole genus of tropical plants (coming from the ancient Greek for sheath) and a family of beetles, and could be a rather unusual family name, perhaps a variant of Cole. But I can find no information about the origin of the name of this street, now best known as the address of one of Hull’s several dance schools on the opposite side of the road. 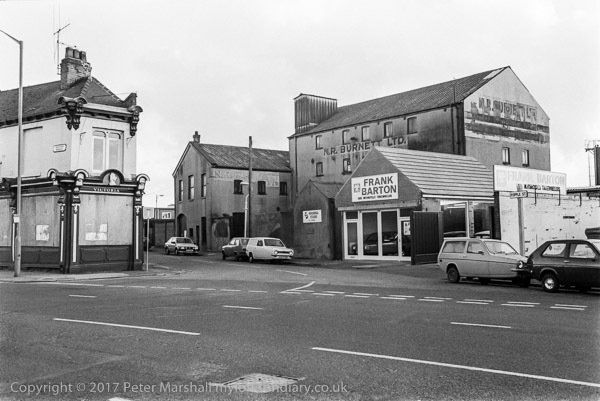 Surprisingly this picture on Hedon Rd could more or less be taken today, and the scene is slightly brighter than when I photographed it, with the Victoria pub having been done up and reopened as the Victoria Hotel Monkey House. The pub, built around 1850, is a Grade II listed building and used to be a popular dockers’ pub – and they gave it the nickname which is now a part of its official name. Like other pubs along Hull’s dockland fringes it also had a reputation as a part of Hull’s red light area. N R Burnett is a timber company founded in Hull in 1935 by Norman Rutherford Burnett and became a private limited company in 1941. During the war it was based in York, but returned to Hull in 1945, and was based at the Albert Mill her in Popple St until 1960 when it moved to larger premises in Great Union St. It was one of the first suppliers for caravan builders. They still operate from sites in Sutton Fields Industrial Estate, Hull and Ossett as an importer and merchant of panel products, softwood and hardwood timbers. Another digest of daily posts during Hull2017 on Facebook, about the pictures added daily on the intro page at Hull Photos. Comments and corrections to the captions and texts about the pictures are always welcome here or on Facebook. This daily posting will end on 31st December 2017, though more pictures will be added to the site. 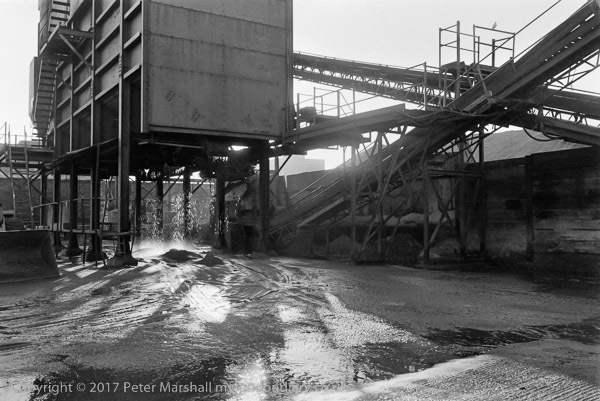 The sand and gravel cleaning plant at Tower Street Wharf is seen in many pictures taken from the opposite bank of the River Hull, including a number of my images, but this was the first time I had taken a closer view. 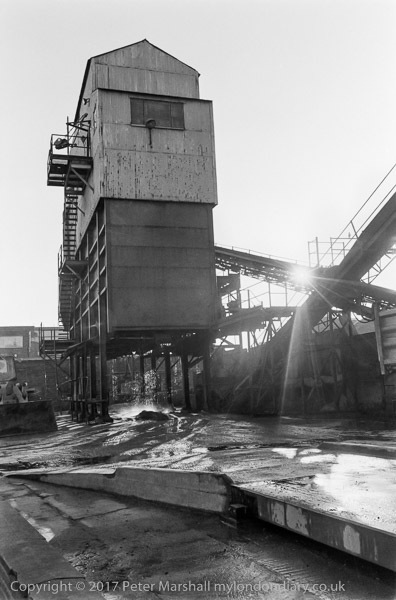 This view shows the north end of the plant, and I think was taken from Tower St, looking roughly south and clearly towards the sun, shining through into my lens, though I tried to hide it behind the conveyor. The image suffers considerably from the flaring of this direct light source and it was not really possible to get a usable print in the darkroom, but scanning the negative and digital processing gives an improved result. Moving a little closer put the sun behind the structure but also meant I could not show its full height. Concentrating more on the back-lit water draining at the bottom of the plant creates a rather more powerful image – and this was one of a small group of pictures that won a prize from the Building Centre shortly after I took it. Looking upstream from the sand and gravel wharf, with the Humber Star making her way up-river past the moored Joyce Hawksley. In the distance, beyond the Pease Warehouses the Drypool Bridge is raised high in the air. The Humber Star, a small 274 ton bunkering tanker built in 1969, had a slightly curious life, with her name changing from Wade Stone in 1977, and reverting to that in 2009. Soon after while an effluent carrier for Oran Environmental Services she sank at her moorings in Southampton, polluting the River Itchen with both fuel and effluent, but was refloated. In November 2011 the Wade Stone, then owned by Britannia Shipping Ltd but registered in Sierra Leone was detained as unseaworthy at Southampton for at least 3 months. In 2012 she again became the Humber Star but was renamed Kara in 2013, and was still working in Malta in 2014. I’ve found no record of her since that date. 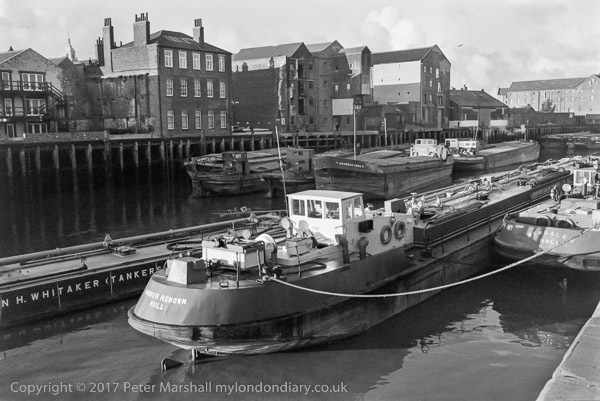 The barge Joyce Hawksley was built at John Harker (Shipyards), Knottingley for Flixborough Shipping Co in 1964 and carried aggregate. Until a few years ago she could still be seen on the River Hull, but I don’t know if she is still there now. Their former home, a Grade II listed building, is still on Tower St, but most of the buildings and structures in this picture have gone. Another picture of Northern Divers. 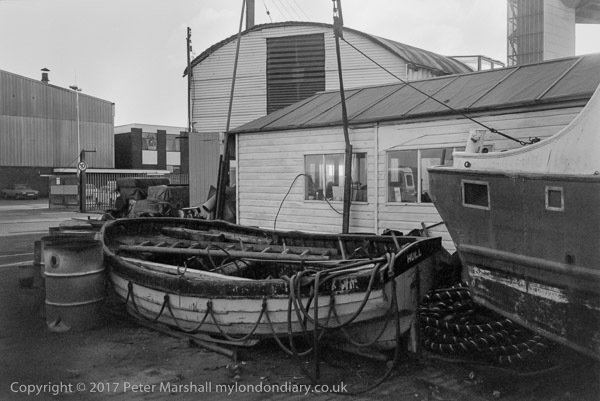 The building in the background is still there, and is the Grade II listed former Trinity House buoy shed, built in 1901. 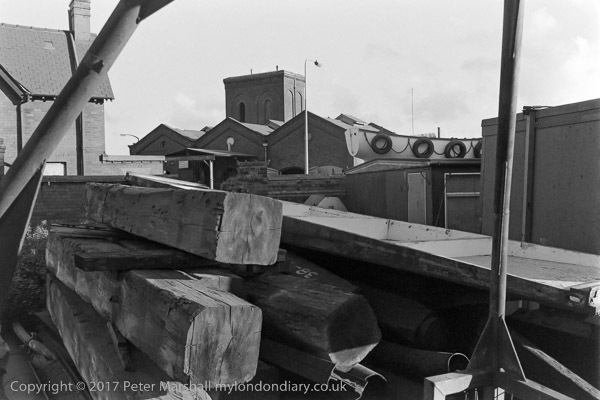 A pile of old timber, perhaps from a riverside mooring jetty and some industrial premises on Tower St, with a boat on one of the roofs of Northern Divers. 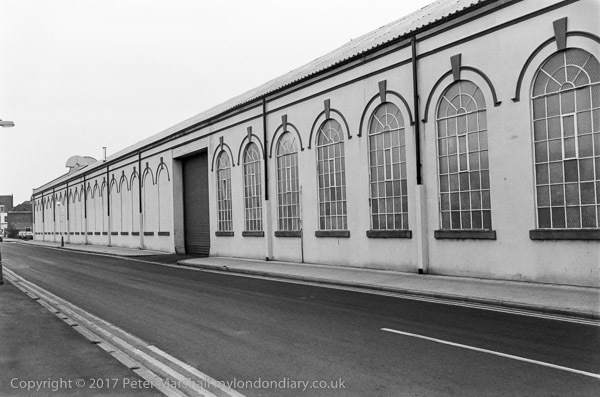 The building with three bays was the premises of Erdmann Engineering, and was I think built as a pumping station for the hydraulic power system used in Victoria Dock (and other Hull docks), with the tower behind being the accumulator tower. The sign on the front of the former hydraulic power station on Tower St is for Erdmann Engineering and the site appears to be still in use. 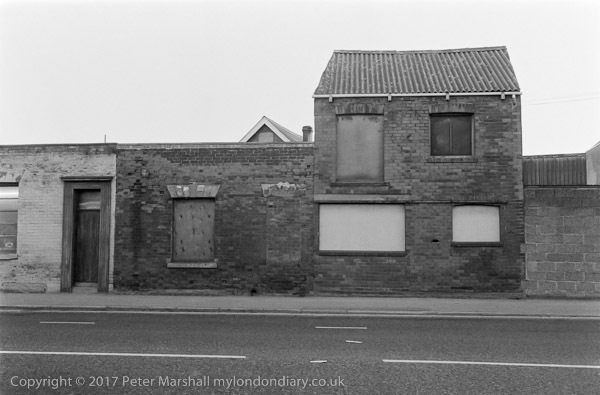 This was a building of some distinction and a significant part of Hull’s heritage and it is perhaps surprising that it was not retained and repurposed in some way, rather than being replaced by the large and undistinguished shed of Hull City Royal Mail Delivery Office. 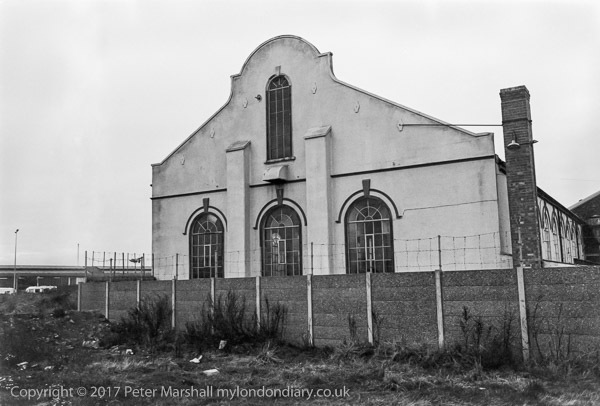 The Royal Mail gives their address as St Peter St, but appears to be on what was and is still known as Tower St, to the south of the former Victoria Dock Drypool entrance. A second slightly closer view of the boats and buildings on the wharf on Tower St. The word HULL on the stern of the smaller boat is more clearly visible. 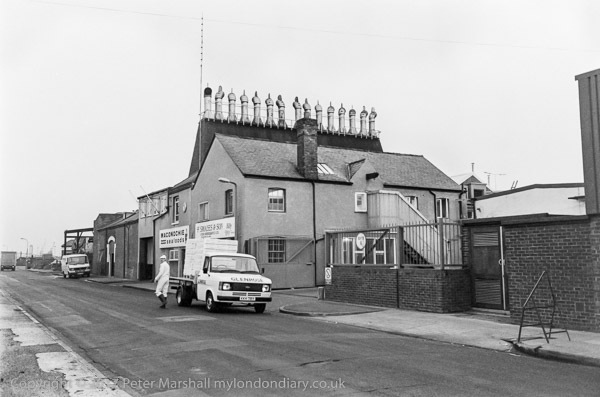 This was a part of the premises of Alan R Worfolk, Ship Repairers & Marine Engineers. 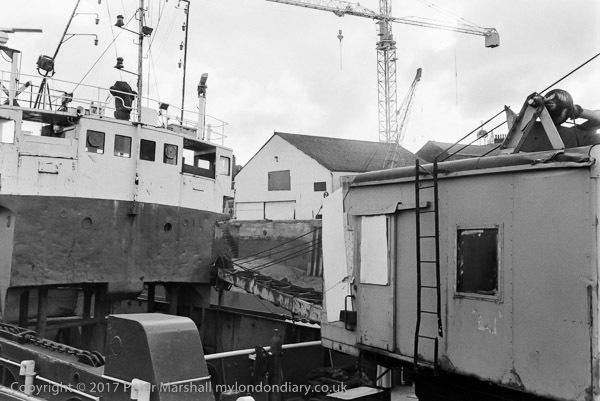 Alan R Worfolk, Ship Repairers & Marine Engineers offered ‘Engine Workshop Overhauls up to 30 Tonnes’ at their wharf on Tower St. Although the tides are sometimes high, the boat on the roof of the nearer structure is probably not there in case of or as a result of flooding. This area of Hull, Garrison Side, to the east of the mouth of the Hull was as the name states, the site of a large fort protecting the city from attack from the River Humber. The earliest defence of the River Hull was simply a chain which could be taken across the mouth of the River Hull to close it to ships, but Henry VIII decided it needed a proper castle too as England expected a Dutch invasion. The castle was built into a much more extensive Citadel in the 1680s, and this remained a military fort until around 1848, and was demolished in 1864. 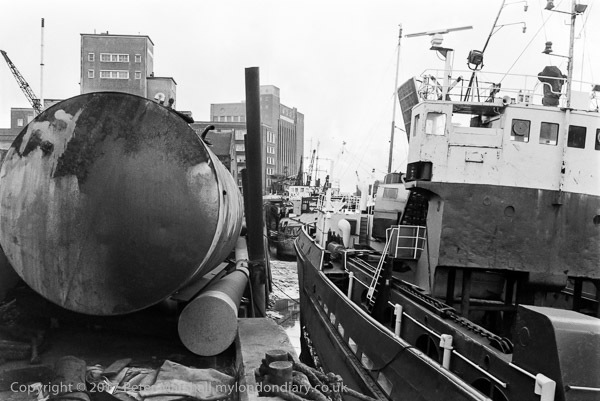 The Dutch invasion only really arrived with the opening of Hull Marina in 1983. The point on which The Deep now stands is Sammy’s Point, named after Martin Samuelson, the son of a Liverpool merchant born at Hamburg in 1825 who was an apprentice at Caird and Co, engineers and ship builders in Greenock who made Clyde Paddlers. In 1849 he came to Hull working as Martin Samuelson and Co and making steel boilers, hydraulic presses for seed crushing and building ships. They had premises in Neptune St, but built a total of 97 ships in 10 years on what is now ‘Sammy’s Point’, including some early steel vessels before selling the works in 1864 to the Humber Ironworks and Shipbuilding Company who soon became the largest shipbuilder on the Humber but were bought up by Cook, Welton & Gemmell Ltd in 1866 – though this company seems only to have begun making ships around 1880. 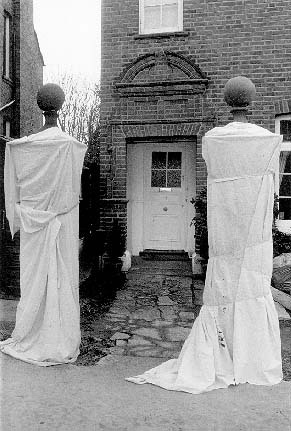 They moved to Beverley in 1901, closing in 1963, and the Beverley yard, taken on by others, finally closed in 1977. Samuelson continued to work in Hull, as a Consulting Engineer and Marine Surveyor and Valuer and became an Engineer to the Humber Conservancy Commissioners, working up until the day of his death at the age of 78. 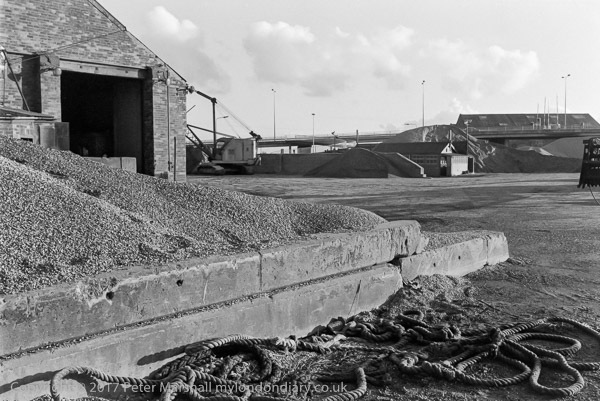 A new slipway was built at on the River Hull at Sammy’s Point in 1962 to enable light floats to be pulled up to a buoy shed being built by the Humber Conservancy Board. Trinity House had been made responsible for safe navigation in the Humber estuary around 1512, and their Buoy Shed is a Grade II listed building a few hundred yards up-river. The responsibility for buoys etc passed to the Humber Conservancy Board in 1907 and following the nationalisation of the British Transport Docks Board in 1981 is now carried out by ABP Humber Estuary Services. 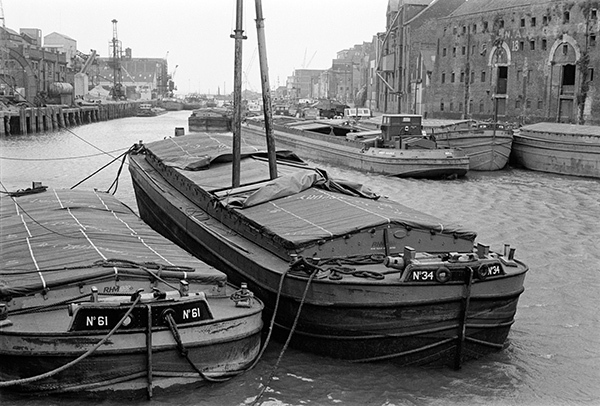 Several tankers are moored by John H Whitaker (Tankers) Ltd’s wharf in the foreground on the Garrison Side (east bank) of the river, including the Humber Renown and Newdale H, while on the other side the moored vessels include the Maureen Anne W along with a number of barges and others. At the centre of the opposite bank is Bishop Lane Staithe and Ellerman’s House. You can just see the top of the Guildhall Tower above the closer buildings and on the rooftop of one of these just to the right stand a small group of men, looking at and perhaps plotting the future of the area. 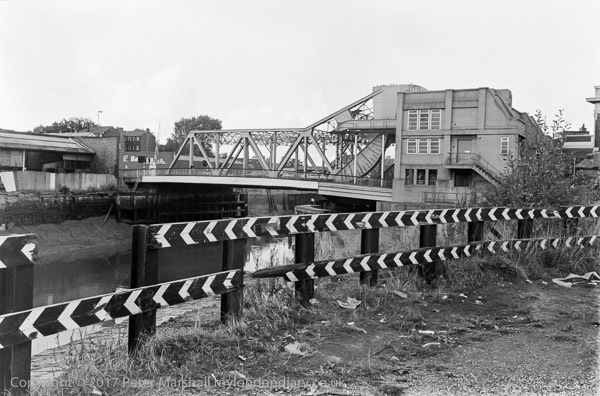 Taken from beside the River Hull, the aggregates wharf had its street entrance on Tower St, roughly opposite where the Holiday Inn now stands. The sand and gravel was landed at the wharf, some coming by barges from around the Trent. Latterly I think it may have been owned by Tarmac Quarry Products Ltd. In the background you can see the recently completed Myton Bridge, or rather the approach to it, Garrison Way, and the spiral pedestrian access to it from Tower St. The large sheds beyond are in the area now occupied by The Deep. Taken a few feet from the previous image it shows the same pile of gravel and brick building, but also the fence between the wharf and the property immediately to its north on the river bank. The painted writing on the wooden board attached to the property is difficult to make out, though the words TOWER STREET WHARF are reasonably clear and the name across the bottom ends in HAM. The name at the extreme left is only part visible, ‘….pso. ….tics’ but is revealed in the next image. My final view of the brick building on the sand and gravel wharf was from a few feet further on and shows a more frontal view. 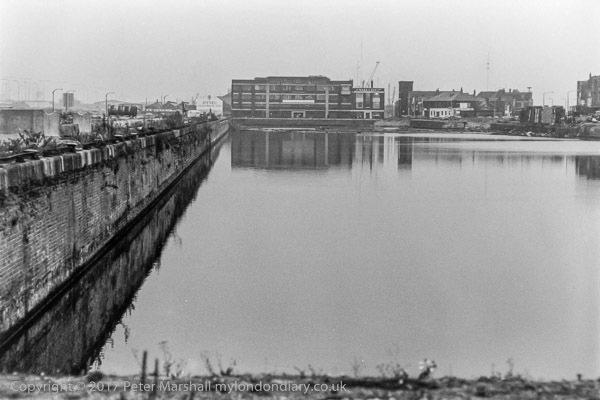 The company name on the board on this building on Tower Street Wharf is no clearer, but the premises at the left of the image – immediately to the north on the riverside are shown to be those of ‘thompson plastics – vacuum moulding and fabrication’. Established in 1977 as Thompson Plastics (Hessle) Ltd, in 1989 it became Thompson Plastics (Hull) Limited was the subject of a management buyout in 2008, when it employed 560 people at its head office in Hessle but together with went into administration the following year, though parts of the Thompson Plastic Group remained viable. One of its main businesses was producing plastic mouldings for use in caravans. AND so I seem to be completely out of visual Christmas clichés. Here instead are a couple of images of other religious events I’ve taken during the year with my best wishes for an enjoyable Christmas and a New Year in which you manage to achieve at least some of your dreams. Al Quds Day – Jerusalem Day – was inaugurated by Ayatolla Khomeni in 1979 and is celebrated on the last Friday of Ramadan as an expression of support for the Palestinians and Israel’s occupation of Jerusalem in particular and the occupation of Palestine, the Jewish settlements on occupied land and Zionism more generally. It was seen as a response to the Israeli celebrations of Jerusalem Day (Yom Yerushalayim) since May 1968, which became a national holiday in Israel in 1998. The march in London this year was held on a Sunday. 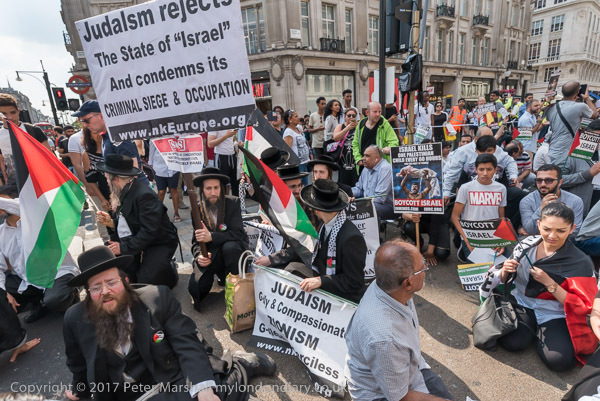 Some Jewish organisations accuse the event and its organiser Nazim ALi of anti-semitism, but in some past years the stewards have asked people with antisemitic placards to leave the march. Clearly it is anti-Zionist, and many Jews conflate the two. This year there were complaints made to the police against Ali for hate speech, which the police investigated and declined to prosecute. As well as making complaints to the police, a small number of Zionist activists, led by Joseph Cohen attempted to disrupt the march. 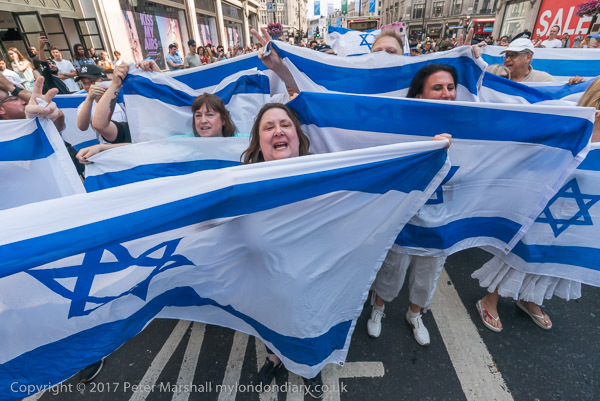 Police kept a small group of them away on the opposite side of the road as the march gathered, but as it reached Oxford Circus around 25 of them ran out into the road in front of the march holding up Israel flags. 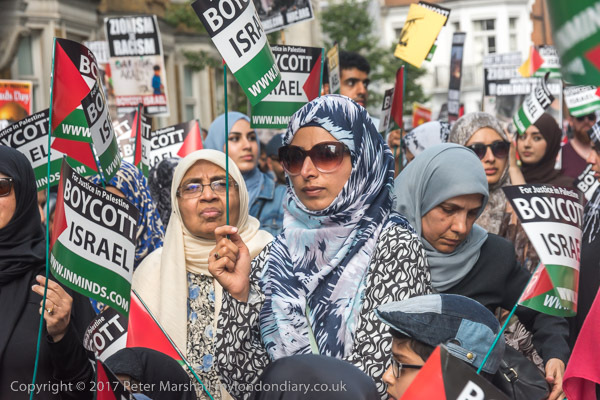 The marchers made no attempt to engage with them, but asked the police to clear them from the agreed route, which eventually they did, but the Zionists simply moved on a few yards and blocked the route again. 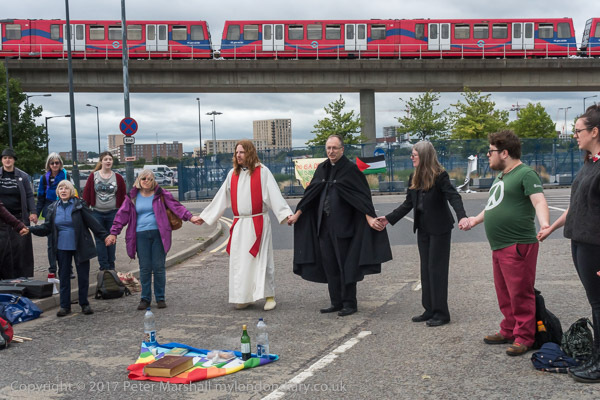 The Al Quds marchers then sat down on the road and waited for the police to move the Zionists again, after a few minutes they decided to hold the silence they had meant to hold later in respect for those who died at Grenfell Tower. By the time this was completed the police had moved the Zionists a little further on, and the march continued down Oxford St with police between the two groups keeping the Zionists moving. I left at this point. 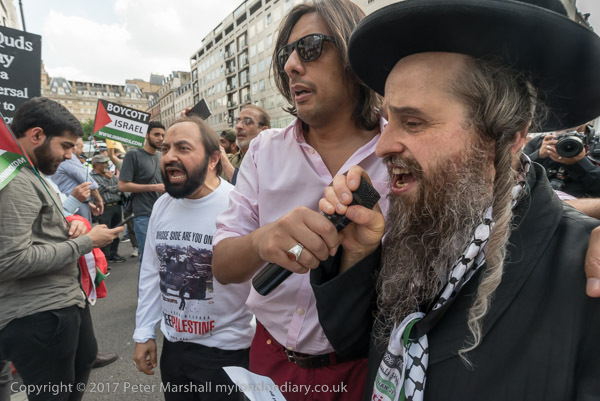 Among those taking part in the Al Quds day rally were as usual a number of Jewish socialists and the ultra-orthodox Neturei Karta anti-Zionist Jews, who marched with a number of imams at the head of the procession. One carried a banner with the message ‘Judaism demands freedom for Gaza and all Palestine & forbids any Jewish state’ and others had posters with similar messages. 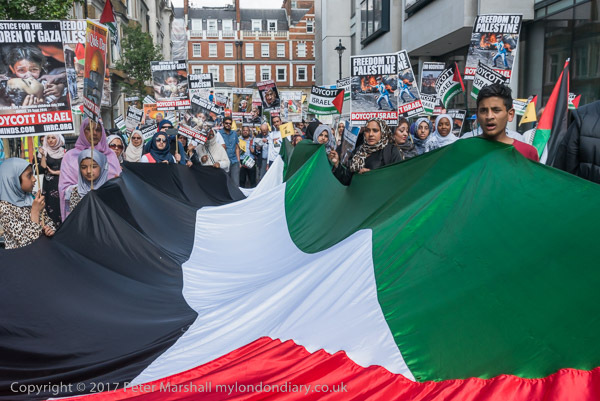 The main banner on the march has a clear message: ‘United Against Racism, Islamophobia, Anti-Semitism and Zionism – Free Palestine – Quds Day – London‘ and this seemed to me to be the spirit in which the march takes place here in London, and why it gets support from a wide range of organisations. This year saw a coordinated campaign before the march to get it banned, accusing it of supporting extremism and terrorism. 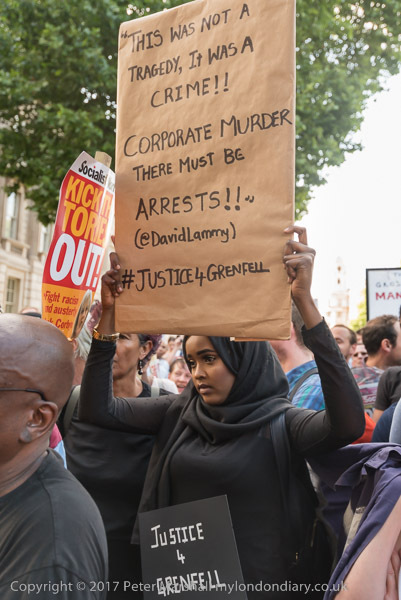 The web site of the main organising group, the Islamic Human Rights Commission web site published some of the viler comments and threats from Twitter, Facebook and blogs which led them to contact the police and write an open letter to London’s Mayor. His reply defended the right to protest and stressed that the police had carefully monitored all of the “speakers and chanting”, and that “no offences were reported from the march.” The web page also links to a wide range of press and web articles about the march, and includes brief details of the speeches. 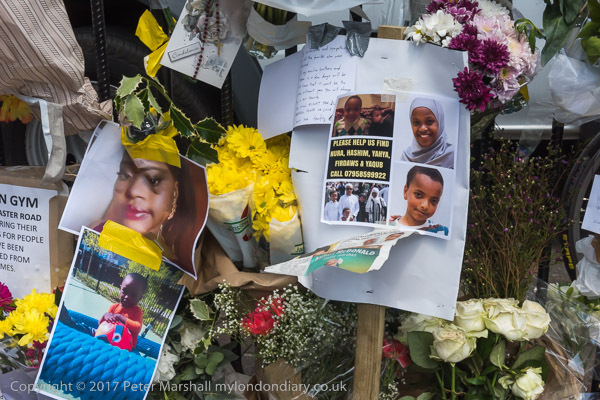 Many connect the frenzy whipped up by right wing and Zionist movements about this march with the terrorist attack by a 47-year-old van driver from Cardiff who drove a van into people on the street outside Finsbury Park mosque early on the following day, a few hours after the march and rally ended, killing one man and injuring 11 others. He was charged with terrorism related murder and attempted murder and his trial starts on January 22nd. He is said to have told people in a Cardiff pub that he was coming to London to attack the march. 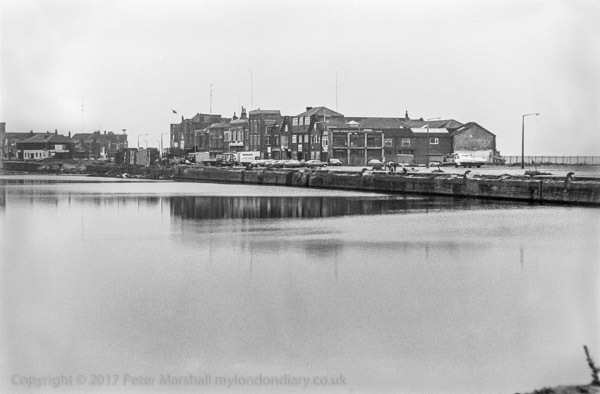 The view towards the east end of the dock with the Lord Line building, distinctive post-war offices for the trawler owners, which are currently being allowed to decay and when I visited in February were left open for vandals. The Lord Line building deserves listing because of its part in Hull’s heritage and reasonably distinctive architecture, and it was sad it was not included in the 10 new listings announced to celebrate Hull2017 – and it is arguably rather more deserving than some that were included. 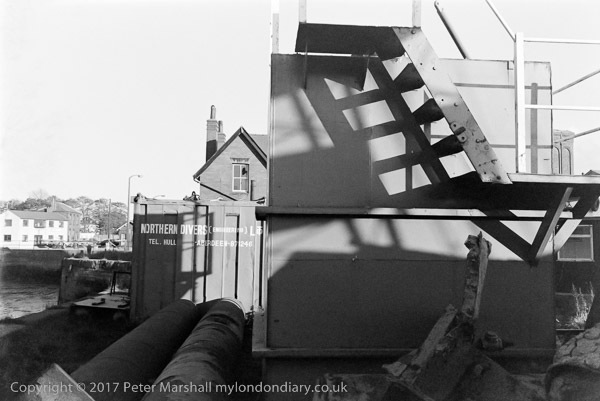 The tower of the Grade II listed hydraulic power accumulator stands out from the cluster of buildings at the right, but most of the other buildings have since been demolished, along with those to the left of Lord Line. Harpmyth Limited became Hytec Electrical (Hull) Ltd in 1984 and was wound up in 1992. Its postal address was North East Corner, St Andrews Dock, Hull, HU3 4S. Taken from the identical viewpoint as the previous image, these two views were probably intended to be seen as a panoramic image of St Andrew’s Dock. Although the dock had closed ten years earlier there was still considerable business going as as the parked cars and vans indicate. The River Humber is on the far side of these buildings and the fence at right. Only a single building still stands on the south side of the dock, and I think it is hidden by other buildings in this picture. A third view of St Andrew’s Dock, taken from a similar position at the north-west corner of the dock, but where I stepped back to include some of the rotting north dockside. The extension dock was to the right of this picture, with a channel at the south side leading through to it. Hull’s ‘Billingsgate’ or Fish Market was formerly on the quayside here, but presumably moved with the trawlers to William Wright/Albert Dock in 1975. A new ‘state of the art’ market, ‘Fishgate’, was opened in 2001, but it sold mainly fish from the Icelandic fleet, and in 2011 they moved their sales to Grimsby. 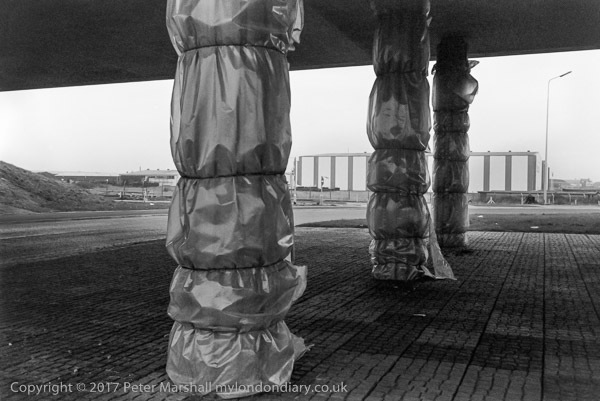 Another view of those curiously wrapped pillars which support the Clive Sullivan Way viaduct over the roundabout. 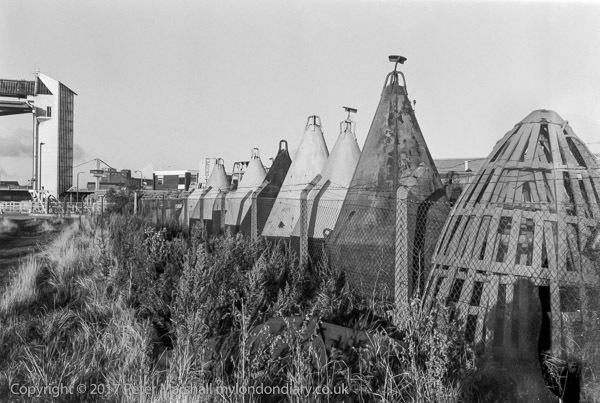 The large striped shed in the background is still there on Brighton St in the Brighton St Industrial Estate, though there are now other buildings in front of it, and is or was part of the Birds Eye factory with the Norbert Dentressangle logo on it. 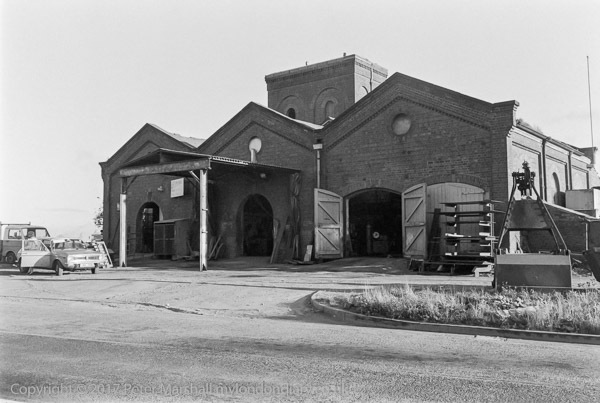 This rather distinctive industrial building was built in 1898 as Hull’s main tram depot when the city got permission for an electric tram system. It seems to have been built as a church to industry. After the trams stopped it was used by buses and then as a store by KHCT, known locally as the Ball Bearing or ‘Bolly’ Shed. 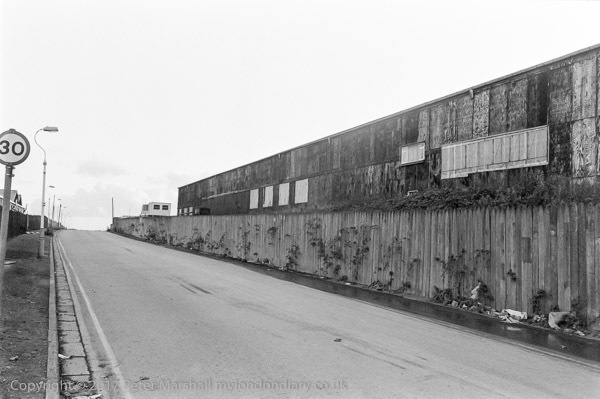 Although still in good exterior condition when I photographed it, it later became derelict and a playground fro local kids and was eventually demolished and the whole area is now Asda. In the background at left is a long factory building which again seems to have disappeared. Hull corporation got permission from Parliament to construct and operated an electric tram system in 1896, and the first rail was ceremonially laid in June 1898. Siemens supplied the electrical equipment and the system used an unusual centre groove rail from Belgium. The Liverpool St depot in the pictures was built in 1898 as the main depot and workshop, and a number of the trams were built their until 1925. The first trams ran along Hessle Rd on July 5th, 1989 and they were replaced by trolleybuses between 1936 and 1945 and the building became a bus depot. Over the years the name changed from City of Hull Tramways to Corporation Tramways in in 1919, then in 1931 to Hull Corporation Transport. In 1945, after the trams were replaced by buses it became Kingston upon Hull Corporation Transport, and finally in 1975 Kingston upon Hull City Transport or KHCT. The lack of any signage on this and the previous image suggests it might have been no longer in use when I took the photograph. At the left is the newly built Clive Sullivan Way, named after his death in 1985, but built as the South Docks Road, and the road leading down to the roundabout at the end of Brighton St. 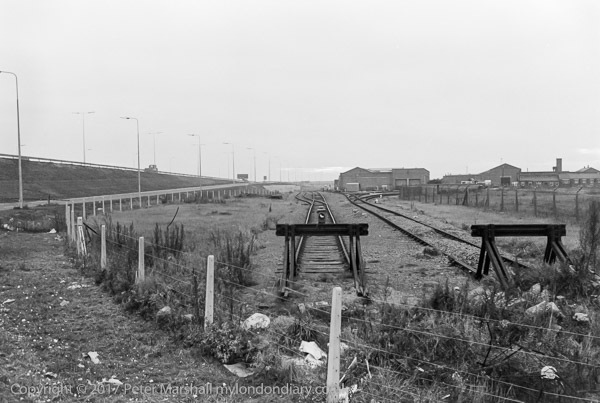 These sidings used to lead to the docks but were retained when the area was redeveloped. I think the large factory building just to the right of centre is still there on the Brighton St Industrial estate, but there are many more recent buildings around. Just one rail line remains and all the track on the right side has gone. 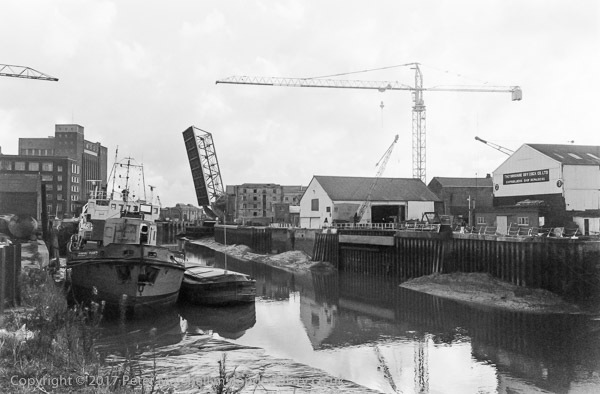 Tower St is on the East side of the River Hull and now runs to The Deep, and the boats and buildings in this picture are all gone, except for the Tidal Barrier at top right of the image. Hull is mainly built on land that was reclaimed from salt marsh, and around 90% of the city is below high tide level. The city is under threat from flooding both by the tide from the Humber and water from the River Hull and the water draining from its extensive catchment area. Various civil engineering works since medieval times have been carried out both to stop this flooding and drain the land for agricultural use, with lengthy drains discharging into the River Hull and the Humber, and banks built up along the river. The tidal barrier, built in 1980, is lowered when exceptionally high tides are expected (though everyone in Hull believes that the first time after it was completed it was needed those responsible forgot to do so.) But at least since then it has protected the city, though it was a close thing in 2013, and some parts of the dockside flood walls were overtopped, and have now had a couple of feet added to them. But Hull is still vulnerable to flooding from exceptional rainfall in the hinterland, and in 2007 8,600 homes and 13,000 businesses were flooded. June 14th is now an important date in British history. The day of the great fire. On a smaller scale that the Great Fire of London, though killing perhaps a dozen times as many people. And a public spectacle that shocked us all with an immediacy that the earlier event lacked, shown live on TV. Though the TV pictures showed nothing of the true horror of people being burnt alive inside their homes. 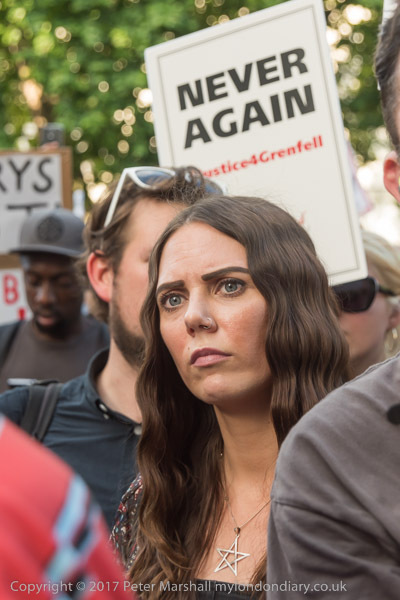 Several of my friends had connections with Grenfell Tower. It was where one had lived for several years when he first came to London, and I think one of my Facebook Friends – who I didn’t know personally – was a resident and a victim. When I woke to the news at 7 am I thought briefly about whether I should go there. It was obviously a huge news story, but it would be a couple of hours before I could be there, and I was sure there would be many others covering it. And it isn’t the kind of news I feel particularly well equipped to cover, either in terms of lenses or personality and I don’t have the kind of direct links for getting the story out that you need for a major incident. The kind of story of it I would be interested in too would require a long-term commitment, making contacts, getting to know people in the community and going day after day, and I wasn’t ready to give that. I thought that going there I would just be in the way, and stayed home. Some of my photographer friends were there even while I was still in bed, woken by calls to cover the event or ealy risers who switched on the radio, heard the news, picked up their cameras and jumped on their bikes. Had I been younger and closer I might have done the same. Others I know rushed there as volunteers to see what they could do to help, and some remained going there day after day – and I followed their reports on Facebook. 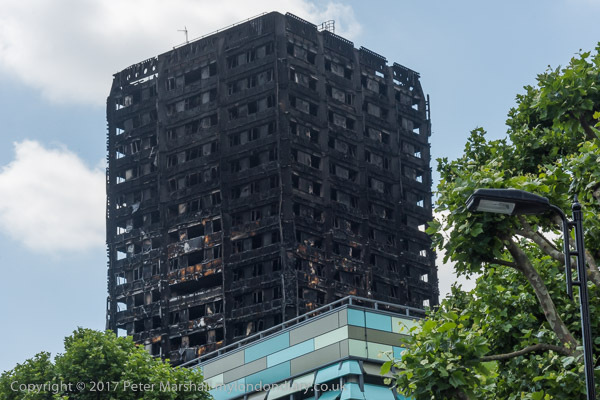 It was three days after the event that I first walked close enough to see the blackened tower, going to pay my respects at the shrine outside Notting Hill Methodist. The media were still there behind the police tape sealing off a large area around but I didn’t really feel one of them, I was there as a human being, not a journalist, though I did take a few pictures and sent some to my agency who I knew wanted them. 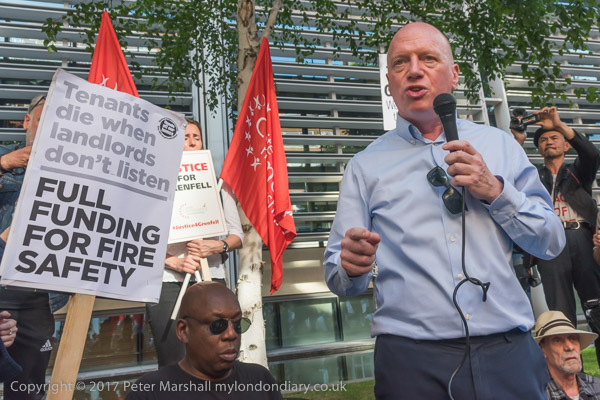 And Matt Wrack, General Secretary of the Fire Brigades Union, spoke about how cuts had inhibited the ability of firefighters to deal with events such as this, and that the system of fire inspection had been deliberately made less rigorous to allow councils such as the Royal Borough of Kensington and Chelsea to save money on making necessary modifications. Again later we heard the TMO they set up to administer their council properties had deliberately employed an inspector who would not insist on proper measures as a way of cutting their costs. 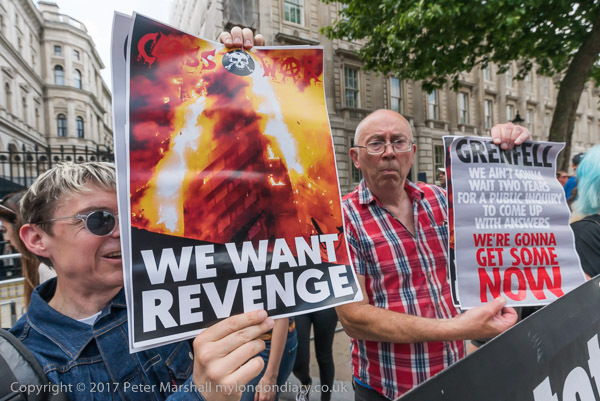 And on the Saturday when I returned from visiting Grenfell, I found Class War holding a brief protest at Downing St.
A day or two ago, an official inquiry – not the Grenfell inquiry – came out with an interim report about fire safety, having taken evidence from over 300 interested people and bodies – and is continuing its work. But many see such official inquiries as a way of putting off action and of sweeping issues under the carpet. 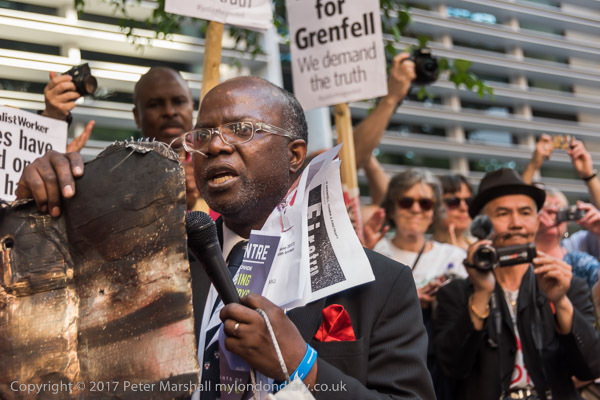 If you want to know the truth about the fire and its causes, read The Truth about Grenfell Tower: A Report by Architects for Social Housing, (PDF available here: The Truth about Grenfell Tower) which was published 5 weeks after the fire (it does start with one small error – the fire began in the early morning of 14th June and so was actually on a Wednesday.) It is a remarkable report and although not definitive (and there are some pertinent comments at the end by Robert Singer) it does I think make the major issues clear. And if a small – if expert – group like ASH can produce this in a few weeks, surely we should have a full official report – and proceedings beginning in the courts – over six months after the tragedy. profit take priority over the safety of people. You are currently browsing the Re-photo blog archives for December, 2017.